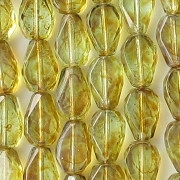 Size/shape: 10mm (long) x 7mm (wide) faceted teardrops with 2 sides or "windows". 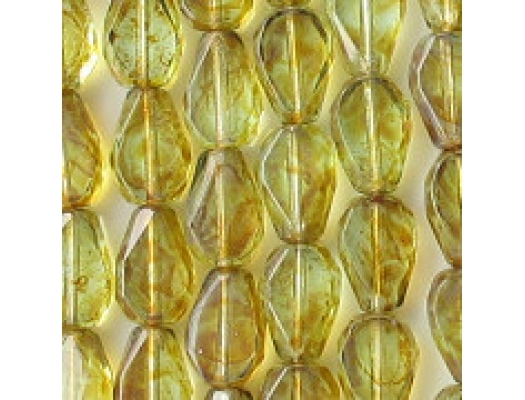 Colors/description: Translucent light aqua with a brown picasso coating over the entire bead; the overall effect is olive green. 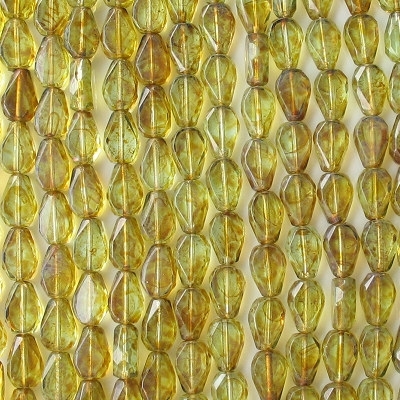 Comments: Although the word "aqua" is in the title, the beads look mostly topaz or, perhaps, olive green. That's because the picasso coating is relatively heavy and overwhelms the aqua color of the glass. Regarding the price, the supplier is charging a bundle for these beads. I doubt the beads are worth what I paid. However, they do seem to be well made, with cleaner facets than most. It is possible that the "windows" are hand-polished, but the supplier didn't say that they were. An examination of the windows shows that they are much smoother than most fire-polished facets are.